The United Nations special rapporteur on torture lambasted the United States for continually obstructing his requests to visit prisons where 80,000 people sit in solitary confinement and to freely speak with inmates at Guantanamo Bay. Juan E. Méndez said Wednesday that he has attempted for more than two years to visit and check conditions at American prisons, including some of the nation’s most notorious maximum security facilities. He added that UN human rights officials have asked for access to Guantanamo prisoners since 2004. "On the federal level, I want to go to ADX in Florence, Colorado and to the Manhattan Correctional Center," Méndez said during a news briefing, Reuters reported. "Those are where people accused of terrorism are taken or where they serve their term." About 80,000 people are held in solitary confinement in US prisons, according to the American Civil Liberties Union. Méndez remarked on the routine use of the tactic in the US court-prison system. "Solitary confinement seems to be a permanent feature at both the pre-trial level and post-conviction,” Méndez said. In October, the United Nations Committee Against Torture chastised the US for its excessive use of solitary confinement. "The numbers are staggering but even worse is the length of terms...It is not uncommon for people to spend 25, 30 years and even more in solitary confinement," Méndez said. Though solitary in the US is “somewhat moderated” at 22 or 23 hours per day -- as inmates are allowed some materials to occupy their time, including reading and writing utensils -- Méndez said it’s not enough. "But it's still no meaningful social contact," he said. While federal officials have responded to his requests for access to US prisons, state prison authorities have ignored his pleas in places such as California, New York, Louisiana, and Pennsylvania. "In one of my last conversations, they said that federal prisons were unavailable. I cannot accept an invitation to say go to a California prison if the federal prisons are off-limits to me." In 2011, Méndez called for a ban on solitary confinement, saying it was used to break down an inmate’s psychological will. “Segregation, isolation, separation, cellular, lockdown, Supermax, the hole, Secure Housing Unit… whatever the name, solitary confinement should be banned by States as a punishment or extortion technique,” Méndez said at the time. The Center for Constitutional Rights (CCR) is currently representing inmates at California's Pelican Bay Security Housing Unit supermax prison who are challenging the prison’s solitary policy. “More than 500 Pelican Bay SHU prisoners have been isolated under these devastating conditions for over 10 years, more than 200 of them for over 15 years; and 78 have been isolated in the SHU for more than 20 years,”according to CCR. In addition, US prisoners with documented mental health problems are often put in solitary confinement for long periods of time, according to the Treatment Advocacy Center and the National Sheriffs’ Association. One of the most notoriously-harsh prisons in the US, New York City’s Rikers Island, recently banned solitary confinement for all inmates under the age of 21. At the notorious US military prison at Guantanamo Bay, Cuba, around 122 detainees remain locked away far from the public eye, as the majority of them have been held at the facility without trial or charge. Méndez said he has been offered certain terms attached to a Gitmo visit, yet he, like his predecessor in 2004, declined to accept based on stipulations he deemed too narrow. "The invitation is to get a briefing from the authorities and to visit some parts of the prison, but not all, and specifically I am not allowed to have unmonitored or even monitored conversations with any inmate in Guantanamo Bay." 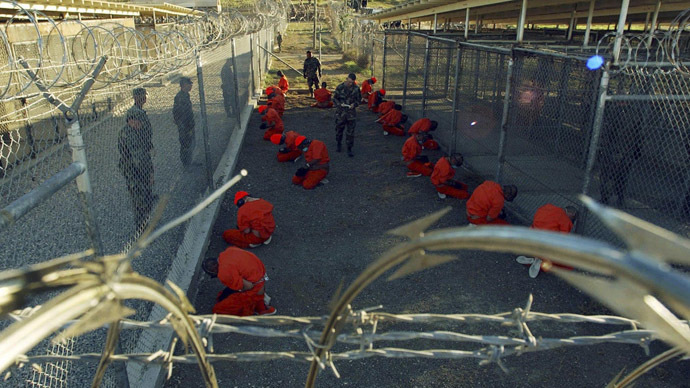 The Guantanamo prison was first opened following the attacks of September 11, 2001, to house suspected jihadist militants with ties to Al-Qaeda. It eventually became an international symbol of human rights abuses. In 2014, the Obama administration made progress in releasing low-level detainees, finding host nations for 28 prisoners – the highest number of transfers from the prison in one year since 2009. That year, President Obama first took office after vowing to close the facility, where many detainees who remain today have been kept for well over a decade without being charged or tried. "I’m going to be doing everything I can to close” Guantanamo, President Obama told CNN in an interview aired on Dec. 21, echoing sentiments he has expressed often since taking office. Congress, he continues to insist, is to blame for the prison’s extended existence. Among other obstacles to shuttering the detention center, Congress has instituted a ban on detainee transfers to the US mainland. In January, Republican US senators proposed legislation that seeks a two-year moratorium on the release of "medium- and high-risk detainees" held at Gitmo. In addition, the legislation would also bar the transfer of any detainees to Yemen for two years. “The last thing we should be doing is transferring detainees from Guantanamo to a country like Yemen," Sen. Kelly Ayotte said. The provision regarding Yemen – where 76 Gitmo detainees are from, more than any other single group at the facility – was justified, the senators said, by the January attacks in Paris – most notably the assault on the offices of French satirical newspaper Charlie Hebdo. One of the two brothers who executed the attack had sought weapons training in Yemen in 2011, according to French authorities. The US has long avoided sending Yemenis back to their home nation, citing security concerns and fears that some would escape prison there or be set free by the Yemeni government. Yemenis that have been set free are sent to accepting third-party nations. Urging for tougher laws to define and ban torture, the UN Committee Against Torture has previously called on Washington to reevaluate the treatment of detainees at Guantanamo. “The Committee is particularly disturbed at reports describing a draconian system of secrecy surrounding high-value detainees that keeps their torture claims out of the public domain,” the committee wrote in November. According to Amnesty International and Human Rights Watch, many of the detainees at Guantanamo were reportedly handed over to US forces by bounty hunters in Pakistan and Afghanistan, after the US distributed flyers in these countries offering substantial monetary awards for turning in "suspicious" people. Others were linked to relatives or acquaintances suspected of criminal activity, and were therefore considered "guilty" by association. The majority of detainees remaining at Gitmo have been cleared for release, but remain there due to political or diplomatic obstacles in repatriating them. Another 30-some prisoners have been designated for continued detention without trial. These are men considered by the US as too dangerous to release, yet against whom the government lacks usable evidence for a conviction. Even less than that have been referred for prosecution through the Pentagon’s highly-secretive military commission system. Those detainees include Khalid Sheikh Mohammed and four co-defendants, who are accused of orchestrating the September 11, 2001 attacks. The oft-delayed case is still in pretrial hearings. The men were arraigned in May 2012 and charged with 2,973 counts of murder and other terror-related charges. Two weeks ago, a military judge put the 9/11 trial on hold until the Department of Defense walks back an order requiring the judges presiding over the case to move to Guantanamo Bay in order to proceed with the trial. In early February, the case was put on hold again after two 9/11 trial defendants said during a pre-trial proceeding -- the first hearing in six months -- that they objected to the English-to-Arabic translator supplied them, as they recognized the man from one of the CIA’s black sites, where many detainees were quietly rendered before ending up at Gitmo. “My client relayed to me this morning that there is somebody in this courtroom who was participating in his illegal torture,” attorney Cheryl Bormann told Army told Col. James L. Pohl, who is presiding over the case. In addition to Mohammed, the others charged in the 9/11 trial are Ramzi bin al-Shibh, Mustafa Ahmed al-Hawsawi, Ali Abdul Aziz Ali, and Mubarak Bin Attash. The next hearing is scheduled for April, but a trial date has not been set.